There’s something very special about brushetta. The rich, garlic-infused olive oil soaked into the sun-ripened tomatoes and sweet, tangy basil. Humph. There’s nothing like it. Outside of classic Italian flavors and ingredients, bruschetta is a near-household name when it comes to appetizers. The tomato-mozzarella-basil-garlic-oil combo can’t go wrong when mounded on a slice of crusty baguette. Then someone far more brilliant than I came along and figured, “Why not top some char-grilled chicken with this Italian favorite! ?” Brill-i-ant. In terms of quick dinners, it doesn’t get much better than this. Chop, chop…mix. Grill up the chicken and…done. 20 minutes from start to finish, you can’t beat it. And not only that, but this dish is low in calories, high in protein, and contains some heart-healthy fats from the olive oil…plus vitamins, minerals, and antioxidants from the tomatoes, basil, and garlic. In a medium bowl, combine the onion, olive oil, balsamic vinegar, salt and pepper. Add the tomatoes, garlic, and basil to the onion mixture. Set aside Toss in the cheese when ready to serve. 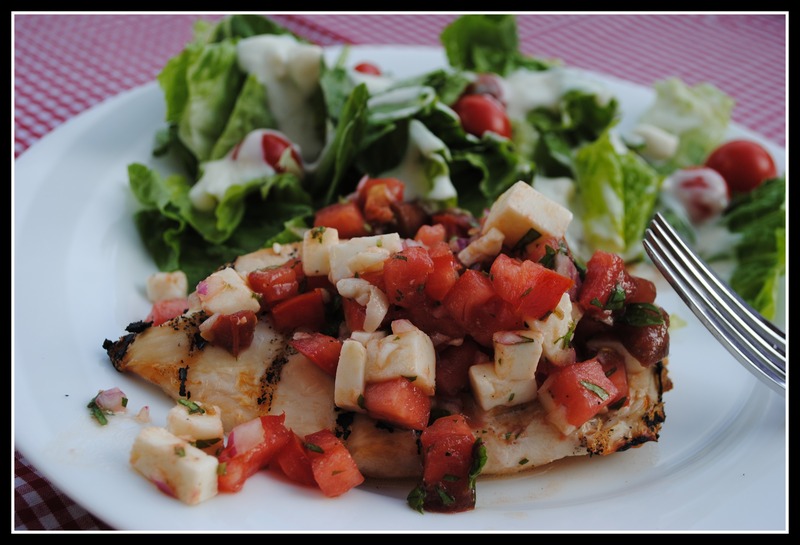 Place chicken breasts between two pieces of plastic wrap and pound to about 1/2-inch thick. Season with salt and pepper and grill on your indoor or outdoor grill. 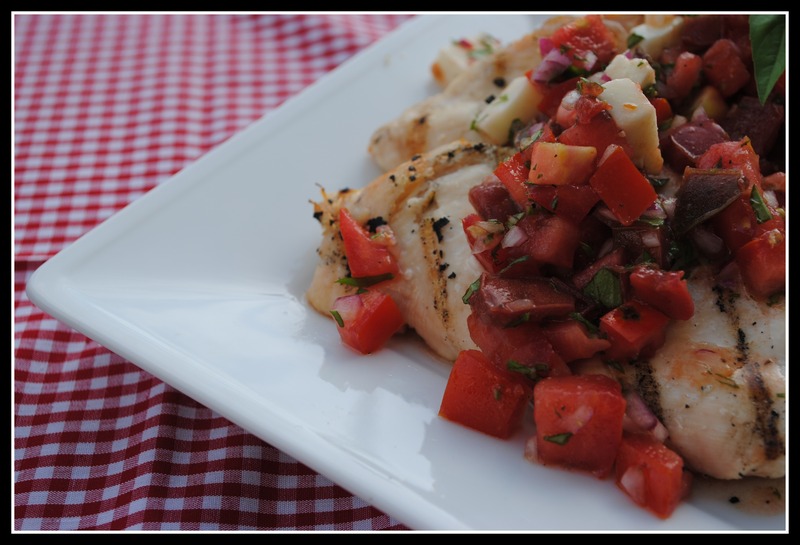 Top chicken with bruschetta and serve immediately. Yield: 4 servings. Result: A light and ideal dish to showcase summer’s sun-ripened tomatoes. No need for a lot of prep or time, this meal comes together in 20-25 minutes or less. Simple ingredients lend to a simple and fresh summer meal that’s kind to the waistline without skimping on taste. Enjoy! Question: What would you like to see (more of) on Prevention RD? I aim to please! Leave your feedback as a comment, if you would be so kind! This looks so colorful, healthy, and delicious. I have a ton of tomatoes growing in my garden so this will be great to help use them up. I’d like to see more vegetable side dishes (because I have a hard time with that) and recipes using tofu! Bruschetta never fails to remind me of summer, which probably explains why I adore it so much! Great idea to add it to protein instead of just throwing it on some bread! Yay for effortless runs! They are always a godsend. I love having wine/beer when cooking. It’s therapuetic. And I’ve said it before and I’ll say it again- you can totally do sub-30. I just know it! so I am guessing that when you do the sub-30 5K, you will be having a beer first then! haha JK…sorry, couldn’t resist. I do love, love, love the bread salad Gina has on her blog…very close to this recipe too…I need to give this a try. Got lots and lots of basil and tomatoes out there in my mini garden! This dish looks awesome!! Hmm…budget meals would be pretty cool! I am starting my last semester of school and Tuesday’s I am at school almost all day so crock pot meals would be perfect! I’d also like some budget and vegetarian meals. This looks great! I need to make this before all my garden tomatoes are gone! This sounds SO good!! I love bruschetta, its probably the best thing ever. I cant believe I never thought to put it on chicken. Awesome job on the run, I LOVE when they’re easy like that. I usually like wine when I’m preparing dinner (but only when it’s a recipe that takes a while to prepare). Sometimes you just need a beer though! Glad you enjoyed it! ps. good run! All your ideas sound great! I’d especially love to see a week of crockpot cooking! That looks delicious Nicole! Love a quick night dinner. I too want to do a sub 30 5k – I am at 34:10, so I am getting faster – just need a flat route like in Oak Park – I had no idea how hilly my neighborhood was until I started to jog it! And you have improved SO much, it’s amazing! You’re my inspiration! Just need some mozzarella and I’m set! Grabbed some freshly picked tomatoes from my moms house today. 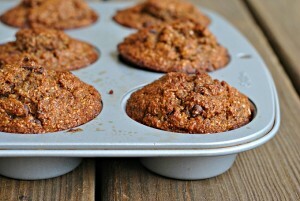 And I made those muffins…. Mmmmm yum! I plan to post about them soon. More money matters are always great for me. I’m livin on a budget! 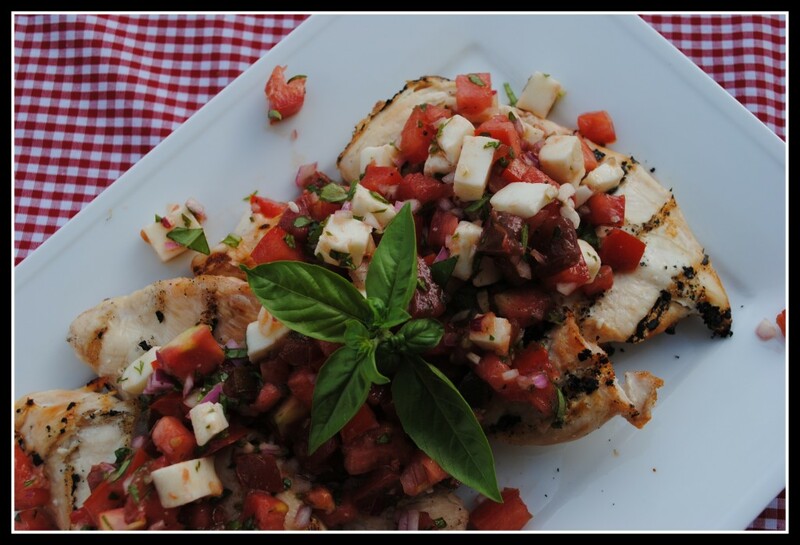 Grilled chicken bruschetta is one of my weekly favs. I like to crumble light feta and a tiny drizzle of balsamic reduction. mmm – worth the few extra calories. 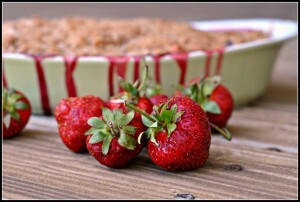 Love your recipes and your nutrition stats! I made this last night for dinner and it was fantastic! My Husband raved about it. Thanks for sharing! We loved this! Thanks for submitting it to the swap! I love having wine/beer when cooking.